This may be the final installment of our Icy Treats series, but do not take that as a sign of our surrendering the summer. There are weeks ahead still of jean shorts and high dives and bare feet, so we’re here to offer you, not something to soothe the last summer hurrahs, but something to go in your bowls and bellies while summer schemes keep on keeping on, full force as ever, right until the moment we skid into fall foliage. My mom was always ready with a cup of coffee. The smell of her coffee percolating before the sun came up was enough to pull me out of bed to catch that ungodly early bus to school every morning, no matter how little sleep I had gotten. But even after that first cup, that pot stayed ready to brew a cup of coffee for anyone who walked through our door at any time of day. priorities: family came first. Period. 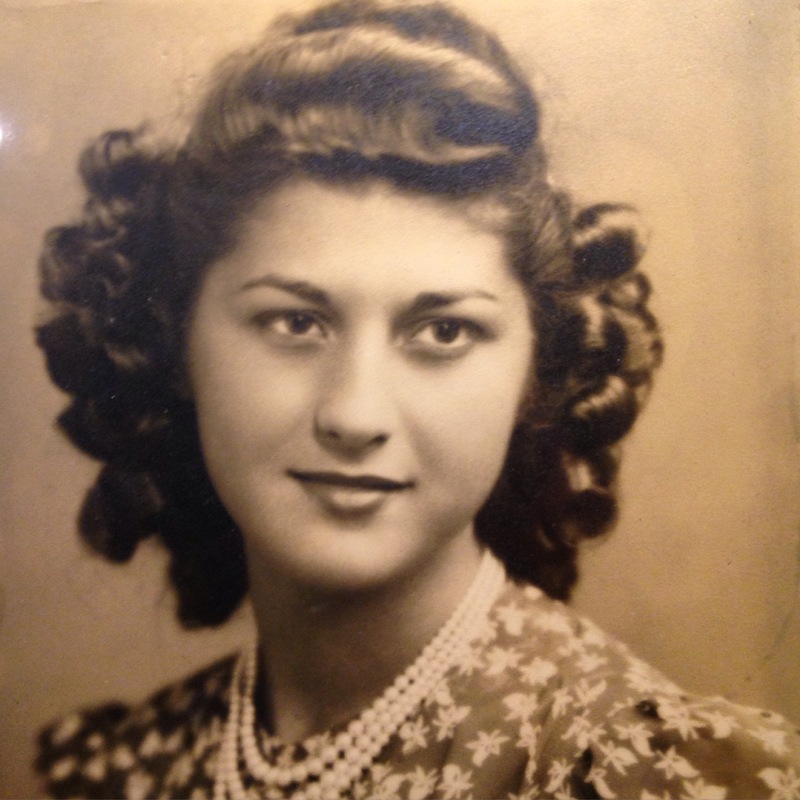 When I think about all those countless breakfasts, lunches, dinners—not to mention, all those pots of coffee made in the same reliable stove-top percolator for decades—all cooked in her tiny kitchen with no dishwasher, it leaves me breathless. She made such a beautiful life for all of us. Like her coffee, she was strong, though not always quiet. She was always confident and sure when it came to how to raise her children. “Because it’s good for you!” she would say definitively, whether referring to vitamins we would line up to receive or a decision delivered that she thought was best. Though my mom didn’t make granita—there was just never any space in her tiny freezer—I know she would have loved this simple, refreshing end to a belt-busting summer meal. 1. You can set it up ahead of time and forget about it for 12 hours—sleep, go about your day, do whatever, and then you’ve got already cold coffee (no waiting around for it to cool) to use in the granita. 2. 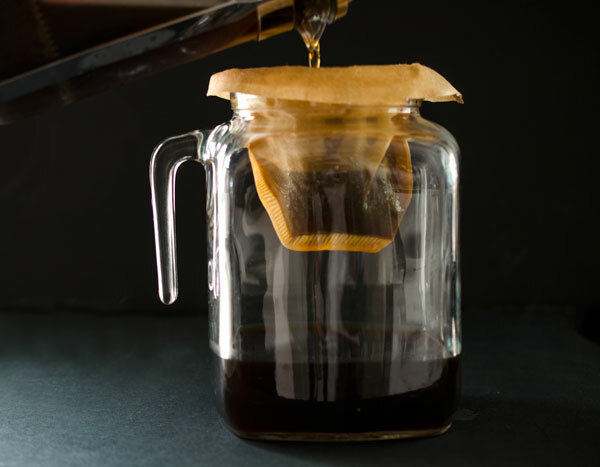 One of our favorite things about cold brew is that it’s less acidic than regular brewed coffee—great for flavor and for your belly. 3. 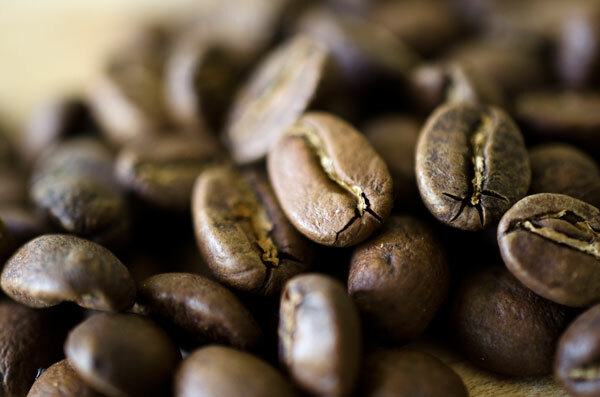 It’s easy to infuse with other flavors, which, we know is not what a lot of coffee purists want to hear, but in the case of this recipe, it’s great. We added some cinnamon sticks and some vanilla bean paste (which is chock full of vanilla bean seeds) to the grounds and then cold brewed away, resulting in some very tasty coffee to get granita-ing with. 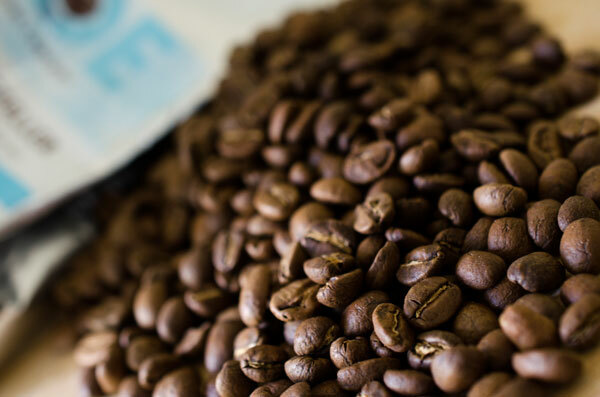 **Also, cold brew has a bit more caffeine because of the higher grounds-to-water ratio, which is either great or something to watch out for, depending. 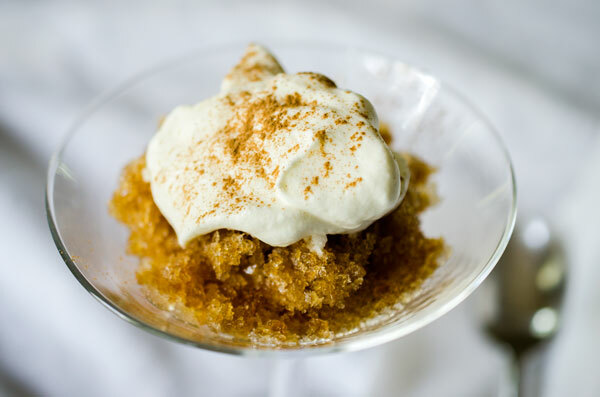 If you’re going to eat this granita in the evening, you may want to use decaf coffee, anyway. 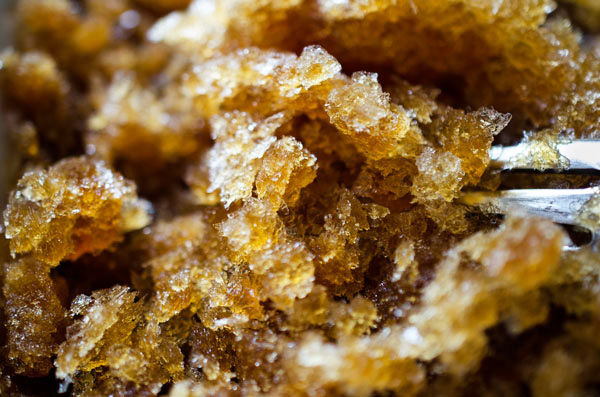 Make the granita about 4-5 hours before you want to serve it. Notes: Even though you’ll only need 1/2 cup of simple syrup for the granita, we used 1 cup of sugar and 1 cup of water so that we’d have some extra to store for cocktails, lemonade, iced tea/coffee, etc. Just keep anything you don’t use in a container or jar the fridge. * Put water and sugar into a sauce pan, stir and heat until the sugar is totally melted and no grains remain. * Cool and refrigerate until needed. 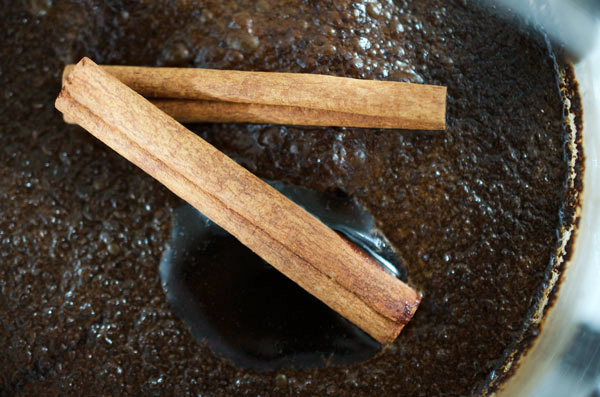 * Put beans, cinnamon sticks, and vanilla bean paste into your French press/container. * Pour in the water and gently stir to ensure all grounds are wet. * Cover and refrigerate for 12-14 hours. If using a French press, don’t push down the plunger yet. Put in the fridge with it up. 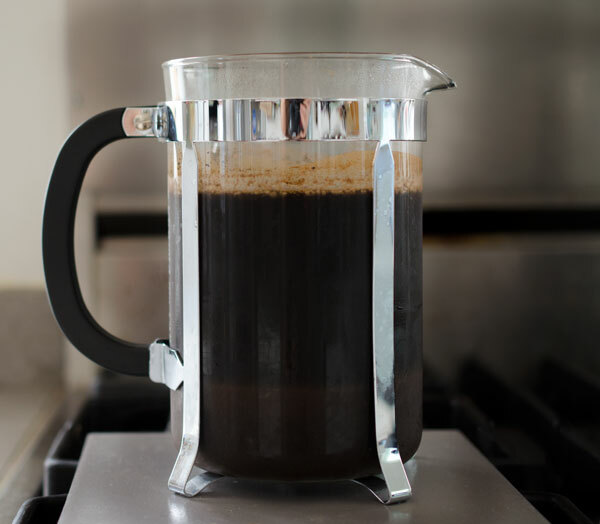 * When the coffee is done, if using a French press, push down the plunger. Line a funnel/sieve with the coffee filter. Set this over a pitcher/container, or hold directly over the lasagna pan if you’re going to immediately make the granita. 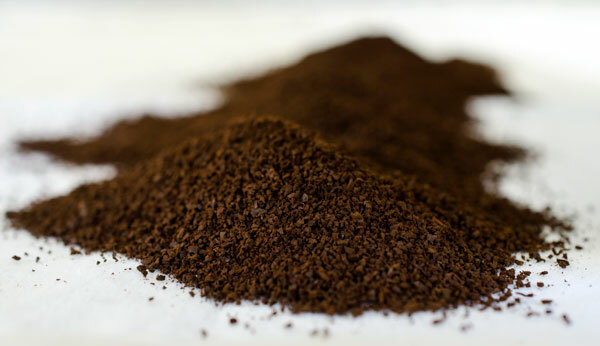 * Pour the coffee from the French press/container through the filter to remove any sediment. * After filtering the coffee, we wound up with 3 1/2 cups of liquid. At this point, your cold brew is ready for drinking, or in this case, granita making. 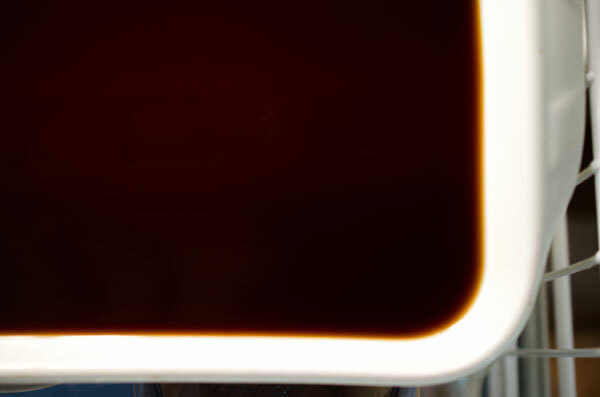 * To your coffee, add 1/2 cup of simple syrup and stir to mix. * To avoid spillage, put your your 9 x 13 glass dish into your freezer, make sure it’s level, then pour the coffee mix into it. * Freeze for 30 minutes. Using a fork, scrape and break up any frozen ice crystals. Repeat every 30 minutes until serving. All liquid should be frozen after 4 hours, but continue to scrape up the granita every 30 minutes until you are ready to serve. Grandma Rose, My Aunt Rosie would be so proud of you and your Mom.